Koroseta does a good sweep of the area to make sure that there is nothing in the area. She is checking in the trees, on the ground, the air, the road and generally everywhere, especially since she had the egg with her now. It wasn't very long before she was reasonably sure that everything was all clear. After a little while she does second, quicker search just to double check and make sure that she hadn't missed anything in the area that could be a threat. Koroseta sees that the area is clear and sets up her camp where she had just checked. After a good meal she goes to the bathroom and then to sleep. In the morning she has a good breakfast and then heads back out onto the road to go further along. She is starting to head down the other side of the hill now as she is continuing making her way towards the city of Ironhurst. As she continues along she can't help but notice that today is warmer than the day before and that the sky is pretty clear. The forest is pretty thick on the other side of the hill. It continues getting thicker until it gets to the point where Koroseta wonders if anything even could come out of the bushes to ambush her. It would have to be pretty good and pushing through the brush. She then wonders what is actually in the egg that she is carrying. It worries her to an extent. As far as she knows, it could be something that would attempt to kill her when it hatched. Koroseta continues along the road as she is wondering exactly how much further it would be to Ironhurst. She notices that the forest is getting a bit more like a normal forest again and less clustered than it had been before. While she did like the many forests and mountains of Humus she couldn't help but be a little homesick, not that she could go back there without having issues. Come to think of it she wouldn't want to go there unless there weren't any of the Elders left. Even then, she would still be considered a criminal that they'd try to kill or apprehend. Thinking about all of this was deep and she was starting to lay less attention to her surroundings as she was fully focusing on remembering the horrible events that had happened after her parents had elected her for the sacrifice. To this day she didn't understand what she had done when had happened with her when she had gotten back out from the edge of the volcano. As Koroseta continues along thinking heavy thoughts she would suddenly be yanked from her thoughts back to the real world by a roar and then a crashing sound as a creature suddenly lunges into the road in front of her. It glares at her with its eyes. Koroseta is ripped from her thoughts as this monstrosity suddenly appears in front of her. She stops dead in her tracks and stands still. This was NOT good. She slowly takes out her bow and starts walking to the edge of the road, hoping to stay back from it. She takes out an arrow and draws the string back, her hand shaking a little. She was not an easily frightened person, but this was enough to scare her, after all, she would be stupid not to be scared of this when she knew that it could easily kill her. As Koroseta walks towards the edge of the road she might notice that the Chimera is still staring down the road. Less at her and more just focusing on something that had been behind her. Suddenly there is a roar from behind where Koroseta had been standing. 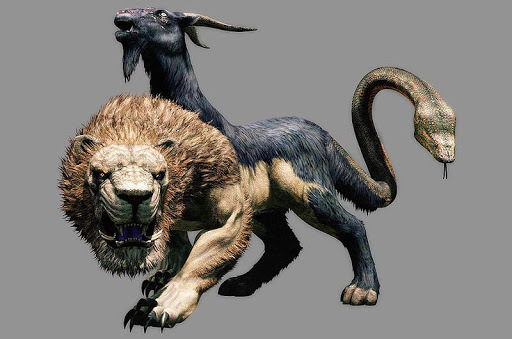 The Chimera that Koroseta was looking at rushed down the road and past her before biting at another Chimera that had been behind Koroseta. As the two start to fight you get the feeling that this might be a good time to run. Koroseta turns another shade paler as she sees the second Chimera. She slowly starts to move away from them both and when it seems that they don't notice her she starts running towards Ironhurst. She just wanted to be done with this crap. She was lucky that there were two or she would have been done. Even if she had gotten away, that egg of hers would have undoubtedly gotten broken somehow. She knows that she can't be far from Ironhurst now. Koroseta continues on towards Ironhurst. As she continues on the forest starts getting thinner and thinner and then after a while she comes to a clearing and at the end of it she sees what she would assume to be the iron walls of Ironhurst. It was rather impressive as the walls were made from all of the iron from the local iron mine. As she gets even closer to it she figures that she is pretty much home free now.